An orange, tangerine or grapefruit with a brown spot, greasy spot or citrus scab will never make the cut into grocery stores, causing growers to lose money on diseased fruit. These are only three of the citrus fruit fungal diseases that L. W. “Pete” Timmer, professor of plant pathology, at UF’s Citrus Research and Education Center in Lake Alice, Fla., is working to predict and control. Timmer is investigating the basic biology and the effects of the environment on these diseases and developing detection tools based on his research. He has been able to describe the sexual cycle and conditions for reproduction and dispersal of the citrus greasy spot, a fungal disease that ruins citrus fruit. “A better understanding of the time-of-spore release of this pathogen has resulted in different timing of fungicide applications to control the disease, and improve disease control,” Timmer says. A major emphasis of Timmer’s lab has been the development of weather-based models for predicting the disease and the timing of fungicide applications for disease control. 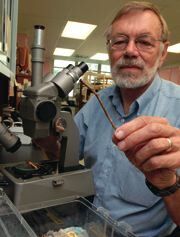 He has developed a model for Alternaria brown spot, called the Alter-Rater, which has been validated for use in disease management programs used worldwide, including Australia, Brazil and Spain. Timmer also has worked to improve understanding of the classification and genetic basis for the cause of brown spot. In addition, he has determined the role of hormones in post-bloom fruit drop, another fungal disease. Timmer constantly evaluates new fungicides as well as different programs and advancements for control of diseases every year.